BACKGROUND: Perennial pepperweed is native to southern Europe and western Asia. It spreads by seed and creeping roots under many different environmental conditions. DESCRIPTION: Perennial pepperweed grows up to 6 feet tall and has basal leaves that are lance shaped, have long petioles, are up to 12 inches long, and are covered with a waxy layer. Stem leaves are smaller and have shorter petioles, but don’t clasp the stem. Leaves have a prominent, whitish midvein. Flowers are white, less than 1/6 inch wide, and develop in dense, rounded clusters at the branch tips from early summer until fall. Fruits are roundish, slightly hairy, measure 1/16 inch in diameter, and contain 2 tiny seeds. 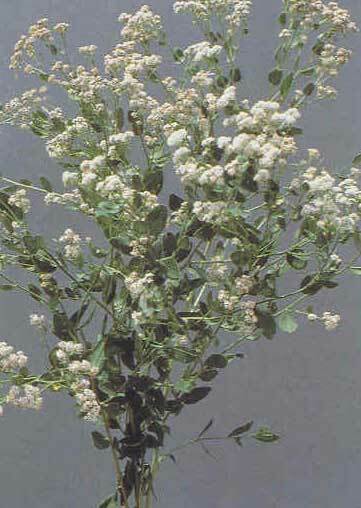 DISTRIBUTION: Perennial pepperweed is widely scattered throughout the U.S. and in many Idaho counties. pepperweed, but herbicides are available to provide control.